WASHINGTON, D.C. – U.S. Senator Rob Portman (R-OH) has been appointed to serve on the Joint Select Committee on Solvency of Multiemployer Pension Plans. “Frankly, very few members of Congress understand the multiemployer pension issue, and Rob is a major exception,” said Sonny Nardi, president of Teamsters Local 416 in Cleveland. “Rob has been a tremendous advocate for Ohio’s retired Teamsters, and understands the impacts to the economy if no action is taken. 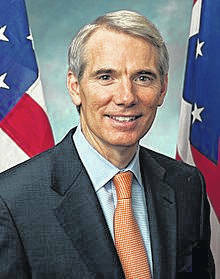 With his inclusion on the Joint Select Committee, Teamsters know that Ohio’s pension participants will be well represented.” In May 2016, the Department of Treasury rejected Central States’ application to suspend benefits under the Multiemployer Pension Reform Act (MPRA), after Portman called on the Department to reject these unacceptable cuts on the Senate floor, in a letter and at a rally with Teamsters in Washington. Since these efforts, Portman has worked with stakeholders in the multiemployer system to analyze and explore the best approaches to comprehensive reform, and has continued to advocate for his Pension Accountability Act. In recent weeks, Portman has discussed bipartisan comprehensive reform options with colleagues on both sides of the aisle, International Brotherhood of Teamsters leadership, and leadership of other unions, Ohio employers and the National United Committee to Protect Pensions. Unfortunately, the scale of the problem facing Ohio retirees in troubled pensions like the Central States Pension Fund (about 48,000 Ohio pensioners), the United Mine Workers of America 1974 Pension Plan (about 6,000 Ohio pensioners) and the Iron Workers Local 17 Pension Plan (about 2,000 Ohio pensioners) will accelerate the longer inaction continues. About 110 multiemployer pension plans are considered in critical and declining status, and that number is increasing; the Central States Pension Fund and the Pension Benefit Guaranty Corporation are both projected to become insolvent by 2025; and more than 60,000 Ohioans face drastic pension cuts to pennies on the dollar if the PBGC becomes insolvent. Many small employers in the multiemployer system already face increasing challenges from creditors, and ultimately could be forced to file for bankruptcy due to their withdrawal liability. If no action is taken, the resulting bankruptcies of contributing employers in Central States could cause many smaller multiemployer pension plans to become insolvent as well, which would, in turn, threaten the even greater population of employers in these plans and, thereby, negatively impact economic growth. The Joint Select Committee on Solvency of Multiemployer Pension Plans consists of 16 members of Congress: four Republicans and four Democrats in the both the House and Senate. The deadline for the committee to vote on a statement of findings and recommendations, and proposed legislation that carry out these recommendations, is Nov. 30. In order to successfully report out legislation, a minimum of five of the eight members of both parties must support it. If the Select Committee reports legislation, it will be referred in the Senate to both the Finance Committee and HELP Committee. Upon introduction of the legislation, each committee must report the bill favorably or unfavorably, without amendment, within seven session days. If both committees report the legislation favorably, the Senate is required to take a motion to proceed vote within two session days. This motion to proceed vote is subject to a three-fifths threshold, and consideration is limited to 10 hours of debate.